Everything we do in life creates our future and our present reality, but in a sense what we call the present is like living in the past, because the present is only the result of our past thoughts (causes). This is how cause and effect makes time (past, present and future) into an illusion. Many say that the only reality is “now” and this is well and true, but the great law of cause and effect proves that “now” is only an illusion of effect. What is truly real is the cause, and the present is the illusion of effects. Very few understand that the things we see are only effects and in which only those people understand how the effects (present physical reality) were brought into existence. 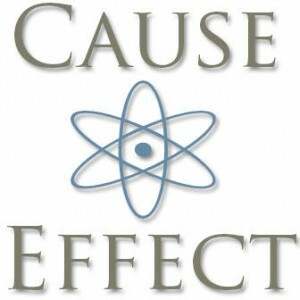 To create desirable effects regardless of current effects (present physical reality) we must continuously create different and yet desirable causes from the “now,” rather than the vicious cycle of causes that match the previous effects, which in turn create another vicious cycle of causes. Imagination can be the cause used to create desirable effects. Imagination forms the connecting link between the “Ethereal Substance” and “The Heart,” between the physical and spirit. Imagination must not be confused with fantasy, fairyland or daydreaming. Daydreaming can only lead to mental amusement and eventually to mental disaster, constructive imagination requires mental effort, directed thought and planned ideas. These are the causes in which we can all can make our dreams come true. Thoughts are causes. Conditions are effects. So if we wish to change effects we must change our minds. It is futile to attempt to fight to change present conditions with effects, or exchange effects for effects. Many try to change their external world so it can match what they think they have within. They can think that they’ll feel better about themselves without realizing that the external world is only a reflection from what is within when we have placed those conditions in our own reality and our own experience. Fighting, exchanging or ignoring conditions (effects) will not make them go away. Ignoring what already exist is only self chosen ignorance, fighting is self chosen drama, and exchanging is self chosen deceit. The definition of ignorance is the lack of knowledge, ignoring your knowledge will define your stupidity. According to the law of cause and effect the deterministic (predestined) view is one in which the entire universe is no more than macrocosmic chain of events from the big bang following one event after another, as mentioned in the 3rd paragraph of “Vibration II,” ‘The macrocosmic causes have been set in motion from the beginning of time or the beginning of our universe.’ At the microcosmic level everything that exists in our physical world is also the world of cause and effects, and because of the law of cause and effect there is no such thing as coincidence. 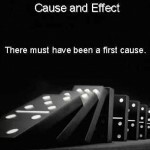 Everything in existence (effect) has a cause. Cause and effect exists and is closely related to the following topics that will come in the coming weeks: “The Butterfly Effect,” “Chaos Theory,” “Karma,” “Action and Reaction,” and the paradox of “Destiny and Freewill.” To prove in this moment that we experience cause and effect in every moment of our lives, I will note this one thing: just by the simple fact of you, the reader, reading this blog post has already altered your experience of time and physical reality. As I write this post (in my present, your past) I have already altered the readers present experience and his or her future events. If the reader would not be reading this blog post they would be doing something else and experiencing a totally different reality. Every thought we think, every act we perform, has its direct and indirect results which fit into the great chain of Cause and Effect. The video below shows a physical example of Cause and Effect, in the meantime open your minds.